World of Zen (Zen no Sekai), 4 vols. The Institute for Zen Studies of Aichi Gakuin University was founded in 1965. The Institute was provided with a new building as well as a traditional Zen meditation hall in 1980, when it was reorganized as an affiliated research center of the university. The school philosophy of the university is “Unity of Learning and Practice” and “A Profound Sense of Gratitude towards the Whole World.” With this philosophy the staff members constantly study and disseminate the Zen tradition. Aichigakuin was founded as the Nagoya Branch Training Center for Soto Zen Buddhism at Daikoin Temple, Nagoya. The Training Center was renamed the Third Academy of Soto Zen Buddhism. The Academy was renamed Aichi Middle School. Aichi Junior High School was established. Aichi High School was established. “Aichigakuin" was decided as the general term. Aichigakuin Junior College was established. The Academic Society of Zen Buddhism was founded. The Aichigakuin ZEN Review (Zengakukenkyu) was first issued. The Aichigakuin Institute for Zen Studies was founded. Prof.
Yuten ITO was installed as the first Head of the Institute. Prof. Hakudo TAJIMA was installed as the second Head of the Institute. Regular study meetings and lectures commenced. Journal of the Institute for Zen Studies Aichigakuin University (Zen Kenkyusho Kiyo) was first issued. Annual tour for studying Zen Buddhism commenced. The Centennial of the founding of Aichigakuin. World of Zen (Zen no Sekai) was published. The Institute was renamed the Institute for Zen Studies of Aichigakuin University. The Research Center and Zen Meditation Hall were constructed. Regular sessions of Zen meditation commenced. Prof. Doyu TAKEUCHI was installed as the third Head of the Institute. Celebrations of the 25th anniversary of the founding of the Institute, and the 10th anniversary of the construction of the Zen Meditation Hall. World of Zen (Zen no Sekai)II was published. Prof. Issey NAKASO was installed as the forth Head of the Institute. Annual tour for collecting research materials for Zen studies commenced. "Brocaded Priest's Robe(Kesa) in Seven Strips" was presented. Annual Newsletter was first issued. Conclusion of the Memorandum for exchange program with the Institute for MT Wutai Buddhist Culture, Shanxi, China. Celebrations of the 35th anniversary of the founding of the Institute, and the 20th anniversary of the construction of the Zen Meditation Hall. World of Zen (Zen no Sekai)III was published. Prof. Eijin ONO was installed as the fifth Head of the Institute. Prof. Syuryu OKAJIMA was installed as the sixth Head of the Institute. Prof. E. SATO assumed the seventh Head of the Inst. Celebrations of the 50th anniversary of the founding of the Institute, and the 35th anniversary of the construction of the Zen Meditation Hall. Wisdom of Buddhism, World of Zen (Bukkyo no Chie, Zen no Sekai) and Introduction to Zen Phrases (Zengo ni Shitashimu) were published. Regular sessions of “Hoko” at the Meijo Koen Campus commenced. The Institute invites special lecturers two or three times a year to hold Study Meetings for scholars, and Lectures for students and general public. They commenced in 1970. The Institute holds Monthly Sessions of Zen Meditation at Zen Meditation Hall every second Tuesday. Each session starts at 5:00 P.M. and lasts about one hour. A special session named “Rohatsu Sesshin" is held on the first Tuesday of December, commemorating the enlightenment of Shakyamuni Buddha on the 8th of December. Anyone interested in Zen, is welcomed to each Session. 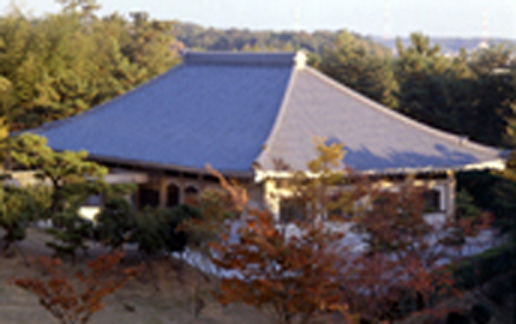 The Institute holds Monthly Meetings in the Hokodai Zen meditation hall on the Meijo Koen Campus. The meeting is called“ Hoko", which means emitting light. Participants meditate on chairs in the first half of the session (they can practice the authentic Zen meditation if they want), and attend a lecture about Zen and Buddhist tradition in the latter half (green tea and wagashi provided). Each meeting starts at 6:30 P.M. and lasts about one hour. The first meeting was held in September 2015 to commemorate the 50th anniversary of the Institute. During summer vacation, the Institute conducts annual tours visiting major Soto Zen temples and other religious facilities in several parts of Japan and other countries. This tour commenced in 1971. Once a year, staff members of the Institute visit some major Soto Zen temples to collect research materials for Zen studies. This tour commenced in 1995. The Institute has published 4 volumes of World of Zen (Zen no Sekai) as the Series of the Institute. Each volume contains about 15 papers written by authorities of Zen and Buddhism. Vol.1 was published in 1976 in commemoration of the centennial of the founding of Aichigakuin, vol.2 in 1992, vol.3 in 2000, and vol.4 in 2015 in celebration of the 50th anniversary of the founding of the Institute. This book, published in celebration of 50 years of the Institute, is an explanatory book about Zen phrases for the public. It contains articles, which had been published in the Annual Newsletters as well as other newly written articles by researchers connected with the Institute. The Institute issues a bulletin for publishing the papers of staff members. Aichigakuin ZEN Review (Zengaku-kenkyu) was first issued in 1959 and discontinued with vol.5 in 1970. It was followed by Journal of the Institute for Zen Studies Aichigakuin University ( Zen Kenkyusho Kiyo), which was first issued in 1971. The Institute issued vol.43 of the Journal in 2015. The Institute has issued an Annual Newsletter since 1997. The purpose of the Newsletter is to disseminate Zen Buddhism, to report on the activities of the Institute, and to invite people who are interested in Zen Buddhism to several events. Main contents are Essays on Zen, Explanation of Zen phrases, Bookreviews and some reports on the special lectures and the annual tour. Copyright(C) The Institute for Zen Studies Aichi Gakuin University All rights of republication in this page are reserved.